I've been in such a mad rush doing things since coming back to Singapore I haven't really blogged about it or talked about it here. I will attempt to correct this. If you don't know the history, I was born in Australia and am an Australian citizen but grew up and spent most of my school years in Singapore. I'm now studying in Adelaide but I return to Singapore during the longer study breaks because I consider it home… I think! Singapore and Adelaide are both fantastic places to live, but they couldn't be more different. Well okay compared to say, Addis Abbaba they are very much alike, but now we're just being pedantic. Pedantic sounds like a luxury brand of grilled cheese sandwich irons. For one, Adelaide is much more laid back. 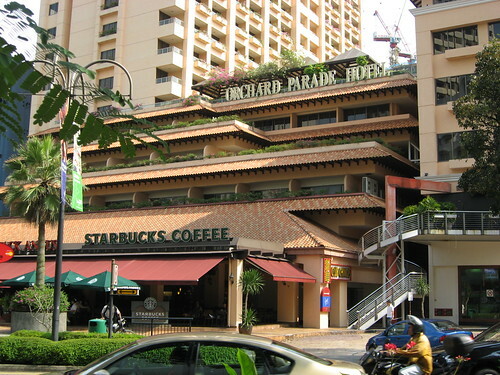 I'm sitting here typing on my Armada M300 at the Starbucks at the Orchard Parade Hotel in Singapore and it's 22:30, and they'll be open for a while yet! Orchard Road is full of people at this time of night, there are cars everywhere, all the shops are still open. In fact I think there are more people down here just before midnight than there are people here during the day! Then there are the differences in the cities themselves. Most of Singapore is huge high-rise buildings that are in a state of flux, being torn down when they're 20 years old to be replaced with even taller things. Adelaide is much smaller and has a built up CBD that almost never changes with many beautiful old buildings, along with a fairly restrained suburbia. I love the bustle of Singapore, but Adelaide provides a nice break sometimes :). What I love though is that I've established enough of a base in both that people recognise me in coffee shops and remember my usual order even if I haven't been there for a few months! When I fly out of Singapore or Adelaide I feel as though my life there is being paused, and when I land in the other my life is resuming there after a several month long pause. It's like suspended animation. Despite life sending my family and I plenty of sour lemons over the years, I'm extraordinarily lucky to live this lifestyle. I'm going to enjoy it while it lasts. Newer post ← @WomanwithBite versus @Rubenerd and co!